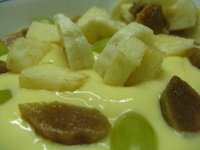 Fruit Custard is one of the most likable amongst the many healthy dessert recipes. I always make it with low fat milk (so you save some calories there). What I like about this dessert is the ease with which it is prepared and the nutrition it provides AND children who otherwise don't eat fruits, they love to eat fruits in this custard. So all in all it is a good DEAL. I always use a egg less vanilla flavor ready made custard powder to make this custard. I think it is much easier for this recipe. Which fruits to add is entirely up to you. Make the custard as per the manufacturer's instructions. I always use Brown n Polson, so I add 2 1/2 Tbsp custard powder for 500ml milk and 3 Tbsp sugar. So, take 1/4 cup of cold milk out of the 500ml and dissolve the custard powder in it completely. Boil the rest of the milk with the sugar. Once boiled, reduce the heat and slowly pour the custard into it, stirring constantly. You will observe that the custard almost immediately starts to thicken. Keep stirring for a minute more (this prevents the custard from sticking at the bottom of the pan). Turn the heat off and cover the custard with a lid (this prevents the skin formation on top). Let it come to room temperature before putting in the refrigerator to chill. Just before serving, prepare your fruits. Make sure all the fruits, except banana are already kept to chill. In a bowl add the assorted fruits and pour the custard on top. Before this just give the custard a quick whisk, to make it creamy. Also you can add a few slices of pureed banana in the custard (this gives a hint of banana flavor in it). Alternately serve in individual bowls. Up till here it is fairly healthy, But if you want, you can decorate with little whipped cream and dry fruits and nuts.